The rigorous eight-week course, taught by ANS staff, guest lecturers, and a Visiting Scholar, introduces students to the methods, theories, and history of the discipline. In addition to the lecture program, students will select a numismatic research topic and, utilizing ANS resources, complete a paper while in residence. The Seminar is intended to provide students of History, Art History, Textual Studies, Archeology, and Data Science who have little or no numismatic background with a working knowledge of a body of evidence that is often overlooked and poorly understood. Successful applicants are typically doctoral candidates or junior faculty in a related discipline, but masters candidates are admitted as well. This year’s Visiting Scholar will be Prof. Mariangela Puglisi of the Università degli Studi de Messina. Prof. Puglisi is, among other things, a specialist in ancient coin iconography and coins found in archaeological excavations. Applications are due no later than February 23, 2018. A limited number of stipends of up to $4000 are available to US citizens, and non-US citizens studying at US institutions under certain visas. For application forms and further information, please see the Summer Seminar page of our website: numismatics.org/seminar, or contact the Seminar Director, Dr. Peter van Alfen (212-571-4470 x153). In the past decade, the American Numismatic Society has been fortunate to acquire a number of African numismatic objects from the Boston-based collector Alan Helms. These objects are mostly produced within the last two centuries and are distinguished by their large size for objects of numismatic value. Most of the objects come from modern-day Congo, Nigeria, and Cameroon. At first blush they come across as simply worked pieces of metal. The ANS caught up with Helms to find out more about his overall collecting practices and what led him to these objects, and to learn about how he grew his collection. Q: When was the first time you bought a numismatic object from Africa? What inspired you to collect this work in particular? I bought my first piece of African currency from Monsieur Huguenin at Galerie Majestic on Rue Guenegaud, and in short order I started buying from most of the galleries in Paris. Whereas a good Baule wooden standing figure in those days might sell at auction for $3,000, $4,000, or $5,000, one could find superb currency for a fraction of that cost. This work remains one of my favorites. Q: Where were you acquiring these objects when you lived in Paris? 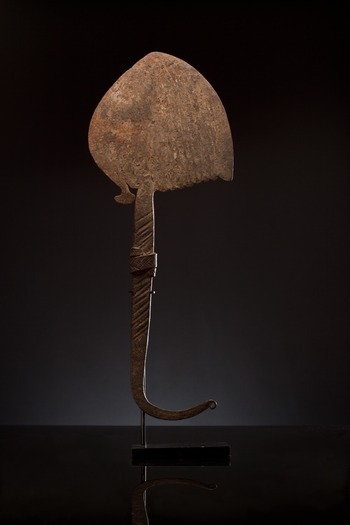 Can you describe the market for African works in Paris at the time? I was a visiting professor at the University of Paris (Nanterre) in 1983 when a colleague took me to several African art galleries and the African collection at the old Musée de l’Homme. I remember being totally smitten. Around the same time, I discovered African metal currency, which I found equally intriguing as African art, and it was more affordable. So I began to purchase examples in Paris. 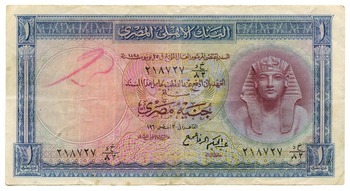 This launched me into a lifetime of collecting African currency in Europe and the United States. Within a few years I had some 80 pieces. Q: How have these objects fit within the context of your overall collecting practices? The two main collections of my life have been African metal currency and Chinese scholar rocks—both incidentally among the world’s most beautiful abstract arts. Q: How did you learn more about the objects you collected? Visual features have been my sole guide throughout so I’ve never studied these objects in any systematic, scholarly fashion. I’m almost exclusively concerned with the forms themselves. But it’s also true that little serious work has been done to date on African metal currency. Few catalogues exist and many of those are of doubtful value. It’s a ripe field for art historians who specialize in African art! Q: You have donated parts of your numismatic collection to several important institutions including the Museum of Fine Arts, Boston, and Wellesley College. Other than the study and care for your works, what relevance do you think they could carry? For one thing, the objects themselves are aesthetically fascinating. Beyond that, they’re an important part of the material history of the cultures that have created them.